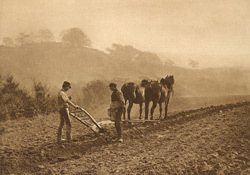 "The ploughing scene - has so many beautiful points in it that I hardly know how to begin reviewing it. The perfection of the detail of the figures, of the plough and its tackle, of the horses and their harness, and the play of light and shade upon them are, even at first sight, so self-evident that I shall not dwell upon them... then there is to be specially noted that most subtle effect to the right of the picture of the moist atmosphere in the ravine cutting off the one upland from the other - this is an effect very common in moorland districts, excepting during an east wind, but it is one that is rarely satisfactorily painted, for the painter as a rule either under-estimates the degree of evanescence caused by the moist air in the ravine, and adopts variety of tone to cut off one upland from another, or he exaggerates it and makes too much of a feature of it. In this photograph the tone all through is perfect, and contains many lessons which artists may study with advantage; indeed, it is to the artist that photography must eventually have its highest value, for while such photographs as Mr. Sutcliffe's, and such prints from them as Mr. Colls had made, are in themselves works of great beauty and pleasure, it is in the accurate knowledge of passing effects which they convey, that eventually their greatest Art value will be felt, and with the combined efforts of two such Art workers, we may hope for and hail with joy a vast series of pictures, undeniable in their beauty, and unchallengeable in their truthfulness, painted by that great painter of our universe - the Sun - who will, with unerring pencil of light, record for us, for all time, the glories he day by day reveals to us."